can be any size that you want, but in this case I would like to talk about the smaller water features. These features will fit in such places as a patio, balcony, or even the top of a table. 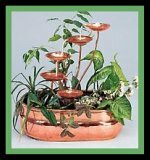 My friends at www.gardenerssupply and www.garden.com has some very nice models, as you can see in the photos I've selected. The bubbling and girggling sounds that the water makes is so relaxing. You will be able to find a size that is right for you. You can create your own personal vacation spot, just by adding a water feature. According to your location,you might want to build or buy some type of decorative fencing section to put up around your patio. This will give you a little more privacy. ** If you are going to put fish in your mini oasis remember to check the area at different times of the day. Know how many hours of sunlight your garden is going to recieve and how much shade. ** What about electricity? You will want to place your feature close to a source of electricity because of the pump. Even though it runs on a regular 110 outlet, you don't want extension cords strown all over the place. "Think Safety"
If electricity is a problem, you might want to get a "solar powered" water garden. It will save you money, it is safe, and you can practice "being green". 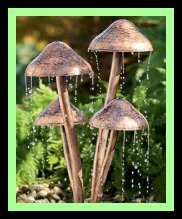 A water feature adds so much to your garden area. I know that you will think so too.